New Delhi, Sep 18: A major air mishap was averted on this 9/11 when pilots of an Air India flight successfully landed in the United States despite multiple instrument failures. The Boeing 777, AI 101 aircraft was carrying 370 passengers from Delhi to New York on September 11 when it suffered multiple instrument failures minutes before landing at JFK airport. The pilots then coordinated with JFK Airport’s air traffic control (ATC) and managed to land the plane at Newark Liberty Airport (EWR). 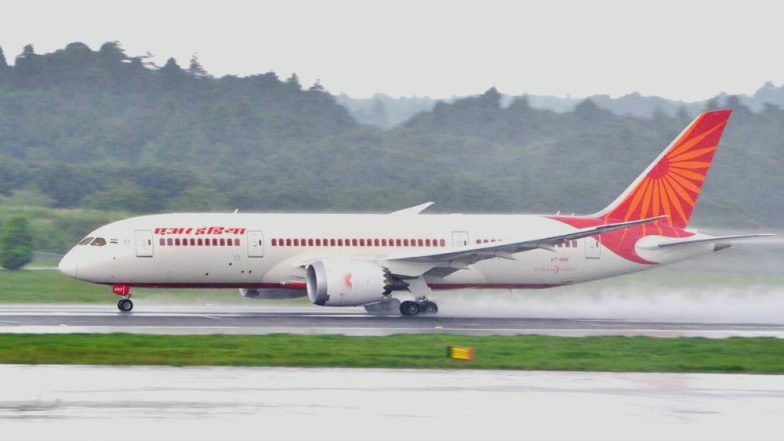 Air India’s senior commander Rustom Palia Captain Sushant Singh, second-in-command, had to abort landing at JFK airport after the aircraft's instrument landing system (ILS) failed at the last minute. Running low on fuel, the pilots then did a go-around and made their second attempt. However, they had to abort landing again the system failure started extending to other instruments. Since the ILS was not working, the pilots needed a decent chance of sighting a runway early enough to make a visual approach. Air India Plane AI263 Makes Landing At Non-Operational Runway At Male Velena International Airport In Maldives: DGCA Off Rosters Both Pilots. “We have some onboard instruments problem, and because of that we are not able to conduct the ILS for (JFK), and now we are sitting for an alternative for what we can do…” the Air India pilots were quoted as saying by Times of India. Then AI pilots asked for visibility at different airports such as Newark (EWR), Boston Logan, Washington Dulles, Pittsburg and Albany where they could make a “non-precision approach”. Meanwhile, visibility near EWR improved, and the pilots and ATC agreed to make a landing there. The EWR final approach tower told the pilots they were getting low on the approach. The pilots took required steps and made a successful landing at EWR after spending 38 minutes in air. While a probe has been ordered to investigate the matter, the pilots and the JFK ATC are praised for their presence of mind and coordination.